Two great Florentine and Italian institutions - the Uffizi Gallery and the Opificio delle Pietre Dure - have signed an important agreement aimed at the care of the Uffizi artworks. 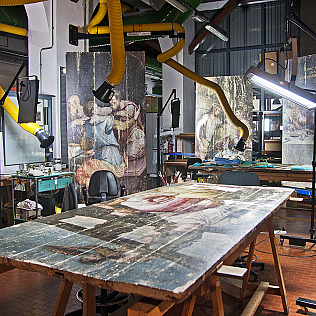 The Opificio delle Pietre Dure is one of the most important institutions at the international level, for the conservation and restoration of artworks of various kinds. It is divided into various sectors, dedicated to the different materials of the works, but also includes a very important School, a museum and a specialized library. The link with the Uffizi does not start now: the Opificio has made very important restorations, such as the one of the Madonna of the Goldfinch, by Raphael, and the one still in progress, the Adoration of the Magi by Leonardo da Vinci. The agreement provides in this connection a form defined by the administrative point of view. The Opificio - through the use of very advanced technologies but above all thanks to its highly trained personnel from a technical-scientific point of view - will be responsible for preventive conservation, maintenance and restoration of the Gallery artworks. The institute\'s professionals will provide advices, will design systems adapted to the preservation of the works and will also be operating in the interventions. Two excellence in the field of Italian and international art work together more and more for the care of the masterpieces kept in the Uffizi Gallery.